In this guide discover the differences between case and care managers and what is involved in their roles. Find out what their daily responsibilities include and how the two professions overlap. Care management vs case management – which is best for my recovery? Although these professions have similar concepts, there are some notable differences which set them apart. Firstly, the term case management has been around for longer and is a more established approach to rehabilitation. Secondly, it is a little broader than care management and involves a wider variety of tasks. Care management is solely focused on the care of the patient and creating a smooth transition between different treatments and stages of care. Case management focuses on rehabilitation and recovery as a whole, bringing all the aspects together to create one successful journey. It can include organising the care plan and many other aspects of recovery. Finance, legal advice, medical help, education and work re-introduction are all aspects of this profession and are a big part of what we do at AJCM. We don’t just focus on the injury, but everything that it affects and how we can overcome any struggles you or your family are facing. Care management has a more specific focus on the injury and not necessarily the wide variety of responsibilities that need to be handled around it. This role involves coordinating the medical side of rehabilitation. From hospital appointments, specialist treatment and location transitions. The focus is on improving the quality of medical care and making sure the treatment is appropriate and that the conditions meet a certain standard. The role usually work with a specific group of people, rather than it varying from patient to patient. This could include the elderly, children, those with physical disabilities or those with a mental illness. This profession is a broader term that covers a wide variety of recovery options. It involves the planning, delivery and analysis of rehabilitation and continuously evolves throughout the recovery plan. In this industry, professionals are constantly measuring productivity and success to improve the rehabilitation process. Not only does this allow patients to achieve the most successful recovery possible, but it is also to make sure they are happy and healthy along the way. If you or a loved one has suffered an injury, it is important to find the right help as soon as possible. A case manager is professionally trained and specialises in arranging care, seeking the right medical treatment and minimising stress of the patient throughout. Although care managers may be involved in the recovery journey and aid with medical treatment, there are many steps before getting to this stage that you may need support with. A case manager brings all of these aspects together and logically incorporates them into a tailored care plan. They pre-empt any risk or set backs and plan solutions to work around them. Continuous emotional support for the patient and their family is a vital task involved in the role. Their skilled input makes recovery less stressful and ensures the patient is the number one priority throughout. This addition to your rehabilitation plan can make a huge difference throughout your recovery journey. From assisting you with a diagnosis to supporting you back into social activities when rehabilitation has been completed. The most difficult parts of rehabilitation can be the care transitions. This could involve being introduced to a medical centre, transitioning to a different ward, being discharged from hospital or meeting with different medical professionals. There are many aspects that need to be supported during these transitions, such as physical and emotional wellbeing. Case managers ensure everything is in place and that everyone is on the same page, including the experts providing the help and friends and family. Although these two occupations may have their differences, they both believe in the importance of setting goals. 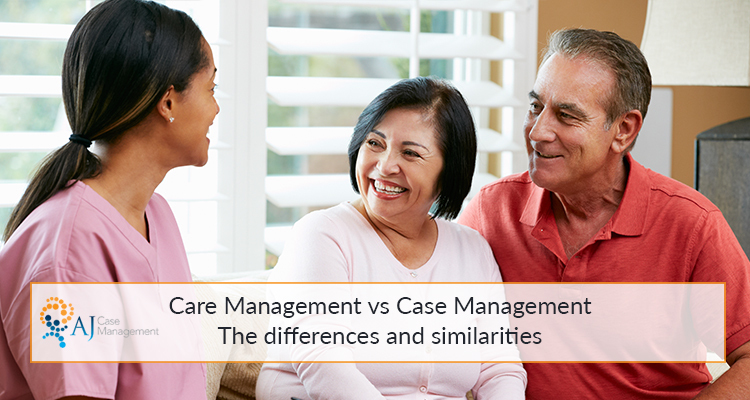 As you can see, care and case management have their similarities and differences. At their core, they are both there to support you throughout rehabilitation and help you achieve your milestones. No-one should face recovery alone, which is why we are there every step of the way. Get in touch today if you want to speak to an expert about finding the right support for your injury or a loved ones.